Every person at Prairieview has a story to tell about his or her journey through life. Each person living here today represents a mixture of the people they’ve met and the influences, actions, events, challenges and triumphs they’ve experienced throughout the decades. We are proud to support every resident in the next chapter of their life. And we are proud of our staff, who put every resident first, becoming a part of their life stories. 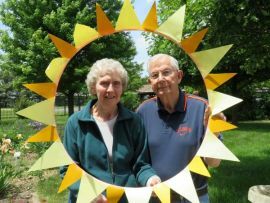 On any given day at Faith Place Memory Care, Rita and Don can be seen walking together in our gardens, baking pies or singing hymns and old favorites with the rest of the group. Don says, “Rita was always so loving to our family.” So it’s no surprise that she loved digging deep into the family genealogy. When Don came back from serving in Korea, he married Rita and they built a house together in Chebanse. While raising four kids of her own, Rita watched other children in her home. When asked what she likes to do now, Rita says, “Walk…walk….walk,” which makes the gardens at Faith Place Memory Care the very best place for Rita to live. She made great pies too. And that doesn’t have to end while she lives at Faith Place now. 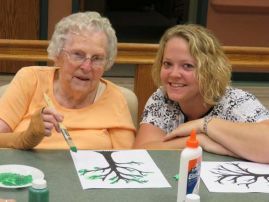 Through her employment at Prairieview, Karie has had an opportunity to educate herself on dementia. She shares this knowledge through support groups, presentations and workshops in the community. When not at Faith Place, Karie enjoys spending time with her family on their 10 acres full of animals like horses, dogs, cats and more. Ivadelle wears a delicate golden watch with two tiny diamonds on her wrist every day. Her father gave her the watch when she was a junior in high school, and it’s been cherished ever since. Ivadelle also loves to show off her mother’s engagement ring, another gift from her father. A shy farmhand asked Ivadelle to marry him many years ago. They eventually purchased and farmed their own land. Ivadelle lived right here in Danforth for many years, until she moved to Prairieview last year. In fact when friends take her out now, Ivadelle loves to drive by her house just a couple of blocks away and check to see how her flowers are doing at the base of her giant pine tree. Ivadelle slowly walks down to dinner in the late afternoon. She says it keeps up her flexibility and strength. Bill grew up in a farm family in central Illinois. In fact, his home did not have electricity until he was 18 years old! He devised a way to listen to the family radio by hooking it up to a car battery. Through the years Bill enjoyed traveling to northern Minnesota to fish for northerns, wall-eyed bass and “anything else that would take the bait.” He’s watched John Wayne movies his whole life and still enjoys them whenever possible at Luther Place in Prairieview, along with visiting with his 7 grandkids and 7 great-grandkids. Esther knows how to live life to the fullest. Her husband, Melvin “Pete”, visits every day and they sit to reminisce about their 69 years together. Esther loved to dance, traveling to Chicago in the 1940’s to dance. During her senior year of high school Esther wrote to famous American big band leader, Guy Lombardo, and asked him to play at the Onarga High School Senior Prom…for all her money, $15.00. Needless to say, he turned her down. She never could teach Pete how to dance, but they still enjoy their time together at the parties and dances and celebrations we have at Prairieview. Virgil farmed in Crescent City, Illinois for 50 years. Now he provides spiritual caregiving to our residents. Over 40 years ago, Virgil joined the group of innovative people that saw the need to care for a struggling older generation and were motivated to ask Lutheran churches in central Illinois to help. Along with a short stay by his wife, Virgil’s mother, father and aunt lived at Prairieview for many years. He has seen firsthand that there is no other place like Prairieview. When members of his family lived here, Prairieview became their home.